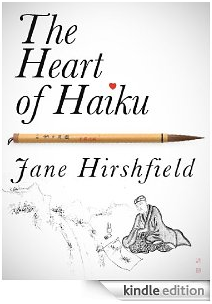 This week I discovered and posted the Interview from FROGPOND with Jane Hirshfield on The Heart of Haiku. I had read Nine Gates: Entering the Mind of Poetry by Jane Hirshfield, a classic collection of essays about the mysterious ways poetry comes to us, and had thoroughly enjoyed it. So this first Kindle Single by Jane on haiku looked very enticing. On Friday night, after reading a free sample of The Heart of Haiku, named “Best Kindle Single of 2011,” I decided to purchase this 29-page essay about the life and poetry of Matsuo Bashō, recognized as the master of concise, compelling Japanese haiku. I downloaded the free App from Amazon, then bought the $0.99 Kindle Single. It loaded instantly. I signed in, and started reading. It was that simple. Saturday I took my computer with me when I went to visit my friend Sali. I explained what I had done, showed her what the essay looked like in the Kindle Cloud Reader on my computer, how it allowed me to select the look of the page, (I chose Sepia), change the size of the font and length of the lines, highlight and make notes. I continued reading, aloud to Sali, where I had left off at home. We were fascinated! Bashō had discovered the earlier Chinese and Japanese poets, wrote renga, tanka, and haiku, became a poet and teacher, studied Zen and Taoism, indulged his senses, then lived like a monk roaming the countryside. 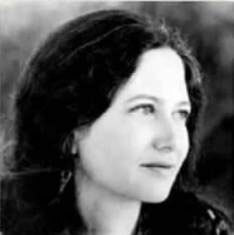 We appreciated the beauty, simplicity and depth of his poetry, and the skill of Jane Hirshfield’s erudite explanations, herself a poet, teacher, and practitioner of Zen. It seemed appropriate for her to explain where Bashō was coming from. Hirshfield had collaborated with Mariko Aratani, her co-translator for the classical-era tanka poets in The Ink Dark Moon. It was dinner time and the other residents were already eating their meal. An aide brought in Sali’s tray, but we were enjoying the story so much I just kept on reading and lost track of the time. I happened to mention that and realized I was speaking out what could easily become a haiku. Sali has that effect on me; she’s my muse! So here’s the haiku on reading The Heart of Haiku to Sali. Also see the excellent Poetry Foundation biography on Jane Hirshfield, including poems, articles and more; Pirene’s Fountain: Jane Hirshfield on Poetic Craft; and What Rainer Maria Rilke inscribed on the copy of The Duino Elegies he gave his Polish translator. You can find some of my own haiku and tanka under My Poems. This entry was posted on December 18, 2011 at 3:15 pm and is filed under My poems, Poetry, Writing. You can follow any responses to this entry through the RSS 2.0 feed. You can leave a response, or trackback from your own site.